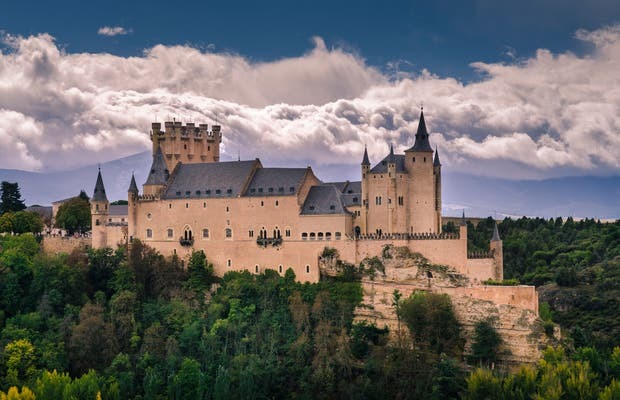 The Alcázar (from the Arabic al-qasr, meaning castle) is, after the Aqueduct, the premier sight in Segovia and has been built and re-built from everyone from the Romans to the Arabs to the Catholics, giving us a good overview of the history of Segovia. The castle itself is a whimsical, fairytale-like structure with point towers, a staggeringly deep moat, rocky bridges, and arched windows which inspire the imagination so much that even Walt Disney himself used the castle as a basis for some of his works. When you enter, you have the option to visit the interior of the Alcazar as well as go to the top of the Juan II Tower, something I'd really recommend (unless you're claustrophobic...the winding stairwell is a bit tight). The interior of the Alcazar as throne rooms, royal bedrooms, and a hall of Kings, all of which are decorated with ostentatious roofs, red velvet, and mind-boggling tapestries. Segovia is a fantastic city and because of that the entire world talks about its special atmosphere, with a lot of life, especially in the Plaza Mayor area right next to the cathedral. I'm not sure if it's because of the famous suckling pig (totally delicious) or for the tapas bars... The one thing I know is that there's plenty to see in this city. Besides the aqueduct, the other main attraction in Segovia is the Royal Fortress. It's a spectacular fortress resembling a castle that elevates over the valley at the end of the city, watching over the city. It has many lookout towers, that stand out because of the singular conic shape. Segovia is a Spanish city located in the Southern part of the autonomous community of Castilla y Leon. The Alcazar de Segovia (a fortress-castle) is located on the top of a rock between the Eresma and Clamores rivers. It has been a part of history since 1122, although experts say it's entirely possible it was built beforehand. It was one of Ferdinand VII and Isabel of Castilla's, the Catholic Kings, preferred places of residence. It was built in the time of the transition between Romanesque and gothic architecture and features unique mudejar decoration in the chambers, which especially stands out when looking at the ceilings. They say that Walt Disney was inspired by the Castle in Segovia when creating the palaces for his good princesses and bad queens. The Alcazar of Segvia was built for princesses and queens, but those with flesh and bones, not made out of paper and watercolors. The court festivals that were held there were reflected in the famous lines of Jorge Manrique's poems. A few meters from the Alcazar of Segovia and from the top of the hill where it governed the city, is a path that runs appareled to the Eresma and Clamores rivers. A dirt trail takes us down the hill, leaving the worn stone paths of the city behind and taking us to a paradise of trees, water and rocks. At the end of the path there's a green leveled area where you can take in the powerful fort from below. A beautiful view and a beautiful path!